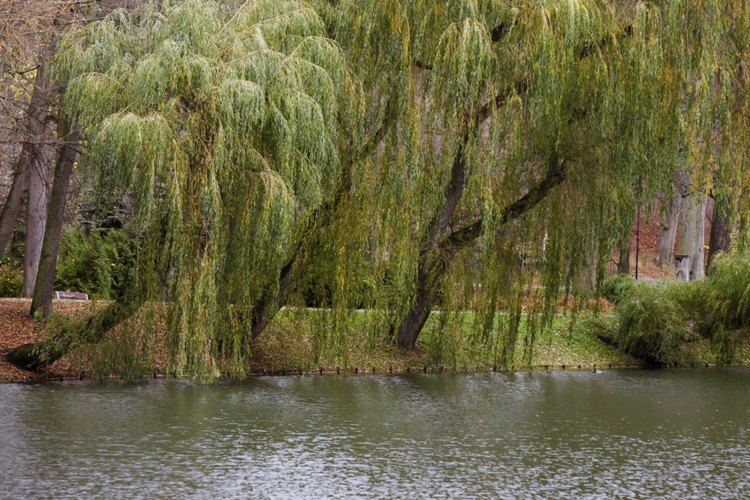 Willows are among the common trees whose wood makes good fireboards. Bow drills are ancient tools that generate heat by friction to produce a glowing ember to start a fire. While using a bow drill effectively requires considerable practice and skill, constructing one is relatively straightforward. In addition to the bow, you must also build a spindle, handhold and fireboard. Strip all the bark from the curved branch. Break or cut the branch to make it about as long as the distance between your elbow and fingertips. Cut a small notch at each end of the branch, about 1 inch from the end to hold the string. Tie the string to each side of the branch using a half hitch knot. Do not make the string too tight, as you will need enough slack to create a loop, through which the spindle will pass. Strip all of the bark from the straight branch to make the spindle. Carve it into a cylindrical shape if necessary, by using the knife. Whittle one end to a dull, rounded point, and whittle the other end into a sharp point. Carve and shape one of the flat pieces of wood until it makes a stable base, or fireboard. The board should be about 1 foot long, so cut or break it as necessary. Carve a small V-shaped notch in one side of the base with your knife. Use the tip of your knife to drill a small hole at the point of the notch by turning it like a screwdriver. Make the hole about 1 inch in diameter, so that it accepts the spindle. The hole should only penetrate the fireboard about half way. Drill a small hole in the center remaining flat piece with your knife. This will form the handhold, and connect to the upper end of the spindle. Wood selection is crucial for making a suitable spindle and fireboard. Light, airy species are superior to dense, heavy woods. Softwood species, such as cedar, staghorn sumac, willow, fir, aspen, poplar and spruce are some of the best choices. You can use a longer bow to create more friction per stroke, but you will have to move your arm farther for each stroke. Conversely, you do not have to make long strokes with a short bow, but you will have to move it faster to generate enough friction. Place the blunter end of the spindle in the fireboard to maximize the friction produced. A nutshell or bone can make a suitable handhold in a pinch. You can also use a low tree branch to hold the top part of the spindle in place, which allows you to use both hands to move the bow.